Where Does Your Site Sit? 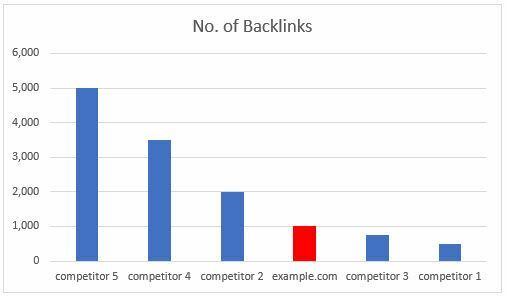 This article takes a deeper look into analysing competitor link profiles, we expand on the principles and concepts described in our guide to backlink analysis. Understanding the competitive landscape is always an important component of any online strategy… The most valuable component that a competitor backlink analysis delivers, is to provide context to your own link profile analysis data. There are some problems or opportunities that can be identified within a link profile analysed in isolation, but most components really need wider context. If we assume we look at the link profile of a site, and it has one thousand backlinks… What does this mean? How do we use this information? In reality, this number tells us very little about what is a good or poor volume of links, because we are missing a scale. Once we start looking at a range of competitor link profiles, we can start to fill in the numbers on the scale to see where our site sits. In the context of the above competitor data we can see that example.com sits just under the middle of the spread… It has more backlinks than competitors 1 & 3 but not by much and has half as many links as competitor 2. Once we start adding in more data, such as authority metrics, referring domains, etc, we start to build a more complete picture, with each new dataset acting like a new colour. Radar charts like this are great for getting a visual feel for a site and its competitors, guiding you towards what is most important and away from the least important stuff. This is a very simple example, but illustrates how the contextual nature of data can lead to making more informed and consequently strategic decisions. We cover the basics of backlinks in our guide an introduction to backlinks, in which we cover all of the most common backlink metrics. Any of these metrics can be valuable to know, but a good rule of thumb is to ask yourself why you are measuring something… If you can’t action it or learn from it, it’s a pointless measurement. You don’t have to use all of these metrics, but you would typically use a good number of them in any competitor link analysis. Conversely you may choose to include a whole load more and we have been non-specific when it comes to the specific proprietary metrics that you may use. Although some proprietary metrics are better than others, the processes that use them are exactly the same. This can apply in many specific applications, but broadly refers to removing data that throws everything else off. For example, if you have 10,000 backlinks and 8,000 of them are from the same domain, which is a parent site or something… And the rest of the 2,000-links come from 1,500 domains, it would be good to remove the outlier (the noise) and focus on the rest. In this example, the ratio of links to domains would be 6.66 if we keep all of the data, whereas without it we get 1.33. These numbers are significantly different and paint different pictures, the former is less useful when making decisions. In fact, the outlier in this situation should be addressed entirely differently to everything else. Moz recommend removing large domains with solid brand and exact match domains from the overview style analysis as they can muddy the waters… But this technique applies across the board to every area of analysis to some degree. We do not mean that you should remove these components from the analysis altogether, rather that when looking at large datasets, it can help to remove this noise from the picture. You might have a local business around the corner that competes for foot traffic into your shops, but online they might not have any presence at all. Depending on your goals & position, you may want to include a range of sites of from both groups in your analysis. There are so many ways to cut and analyse data and so much data that can be analysed that it’s too big a subject to write every possible analysis… So here, we aim to set out each major category of competitor link analysis technique and some examples on how this can help. If you find that you are unfamiliar with the type of analysis, check out our guide to backlink analysis techniques. We touched on this in the section of this guide on why competitor link analysis is important… If you remember the radar graph, this is exactly what we mean by a top-level analysis. In the example of the radar graph, we have multiple data sets that can range in real values between 0 and absolutely loads; being represented on a scale on 0-10 or 0-100. We need these numbers to fall into this range for the chart to have any meaning. Having an axis with 0-1million links and another with a maximum score of 10, isn’t going to produce a chart you want to see. In this example cell D3 is doing this calculation: C3/C9 or 489,061/955,762 to get the answer 0.51 or 51%. 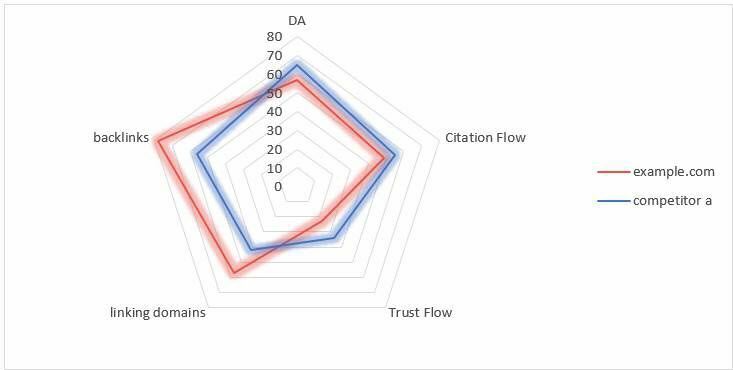 Remember that you need to do this to all of the data on each branch to be consistent, if you use the Citation Flow Metric, you might think that you could just use that as-is, due to it being a number between 0-100… But that would be create an inconsistent process for preparing data for the chart. If the maximum Citation Flow in the range is 57, that is equal to 1, because it is the maximum. Its fine to do it either way, so long as its specified or called out to avoid being misleading. The idea is to create a comparison metric without a unit value like currency or ‘number of x’, the aim of which is to allow us to compare lots of different data in one place. You can choose whatever chart or visualisation technique you want to present this indexed data… But we love a good radar chart! This technique can point you in the right direction without having to do a huge amount of work, it looks good and is almost always insightful. 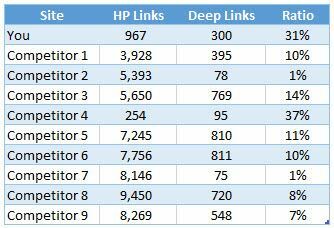 In this example, we can see that we are in the top two for highest ratio, but we have much fewer links in total… This could indicate that as the link profile grows it will level out like the others or it could mean we have some tasty content attracting links. But straight away it provokes questions, which guide us to insights. We can look at this in higher resolution with a distribution analysis, to look at how many pages have x number of backlinks. Again, it is by doing this for a range of competitors that we start to see where we sit in the mix. In the example above, we have plotted the distribution of backlinks to internal pages… This shows the ‘number of pages’ that fall into each bracket of ‘number of backlinks’ for the principle site and the competitors. What this data indicates is where our site’s distribution falls in the range, in this specific example we can see that we are in the bottom end of the spectrum. This could indicate a number of things but would definitely be a red flag, provoking further investigation. If other elements stand out in a similar way within your analysis, this might indicate that your link profile could seem unnatural to Google. This type of analysis can really focus your strategy into specific directions, whether you’re looking at the distribution of internal links or authority. Poor anchor text has the power to incur a penalty from Google, consequently there are a few rules that we discuss in another guide to keep your ratios in the safe zone… What we are looking for here is what our competitors are getting away with. This can provide insights into the strengths and weaknesses of your competitors and highlight potential gaps that you could fill. Linking EMDs are considered strong ranking factors and so this type of analysis can highlight what sort of ratio and number you need. In addition to this we can also compile a list of EMDs to contact or try and get links from, so this type of analysis can directly inform your link building. Once you have collected all of this data for each URL, you can repeat the process for each keyword that you want to analyse. Without automation, this can be time consuming, but it will paint a very clear picture of the competitive benchmarks for entry into the front page. You can apply a formula to this data if you like to create a competitive score, but even without this you should be able to see how this compares to your desired ranking page data. 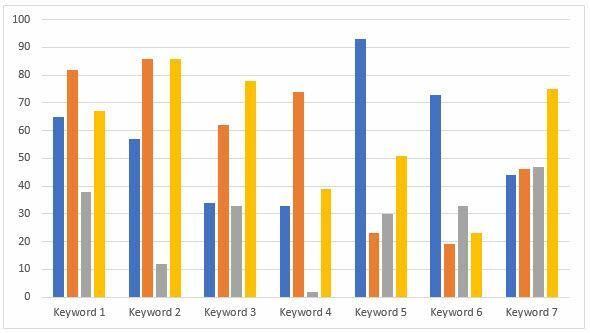 A simpler way to compare keywords is to average the number of links, authority and trust, etc across the top 10 ranking URLs… This can provide some good insights into where the biggest opportunities are. What are your site’s strengths and how do they compare to those of your competitors? What are your site’s weaknesses and how do they compare to those of your competitors? How do you leverage the strengths and weaknesses? Typically, you want to put effort into the area that will make the biggest improvement. More often than not this means improving the areas where your site is weakest relative to your competitors. We are using the scientific method here, meaning that we are trying to disprove not prove the hypothesis. In the table above, crosses (red) means that the evidence is against the hypothesis and the ticks or green mean that the evidence supports it. The N/a simply means that it neither supports or denies the hypothesis. You can see that ‘Evidence 3’ supports all of the hypothesis, because of this it cannot be used as evidence as it doesn’t have the power to help us disprove anything. You will also notice that one hypothesis is supported by all pieces of evidence, this doesn’t mean that it is proven, just that it’s the best answer so far. Remember you only need one piece of evidence that disproves a hypothesis to remove it from the running. This technique helps you to focus your attention on data (evidence) that has the power to guide your decision making. All hypothesis need to be a simple proposition and all evidence should have the power to disprove the hypothesis. A good competitor analysis can help to benchmark your site and set strategic goals for your SEO. We have covered this in almost every section of this guide, establish where your site sits on the curve, whether is the number of backlinks or the distribution of them throughout your site. Are you at the top of the table, the middle or the bottom? If you’re struggling to get on the front page, what does the front page look like, how does your compare? Understanding this can lead to changes and advances in strategy, new goals and a solid understanding of the benchmarks required to average good organic positions for your target keywords. Looking at the growth rate of your competitor link profiles can help to provide a good idea of the upper limits you should be careful to avoid exceeding when building links. If everyone in your space is averaging 30 new links a month, you would be ill advised to start knocking out 300. What is natural is kind of defined by what everyone is doing (to a point), what might be natural for a local electrician business is not the same for a national energy provider. 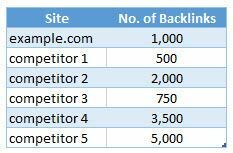 The referring domains in ‘category e’ (linking domains from five competitors) will be the most valuable, as these are domains that link to all of your competitors but not you. This is typically a list of relatively easy wins for link building. If you add in the domain authority / page authority metrics you can prioritise within each category very easily. As you move up the above list, the quality will reduce, but you can repeat this process with a different group of competitors to refresh the lists. 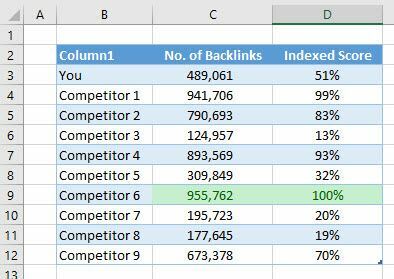 You can also perform this analysis on a regular basis to capture new links your competitors are gaining. This is the simplest and easiest way to group and prioritise your link building opportunities from a competitor link analysis. We cover this topic in a lot more depth in our guide to link building. Our software performs of the checks and analysis discussed in this guide and much more, we are launching a Beta in late 2017, sign up today to get free access to the Beta and 2 months free usage once we launch in early 2018.